The story for fans up nawth was a visit to Pawtucket by rehabbing Red Sox outfielder Jacoby Ellsbury. For the Bulls the story was the tenth win in this streak. Another solid performance by our pitchers, beginning with Virgil Vasquez, visits by Mike Ekstrom and R. J. Swindle, and a close-out by Winston Abreu. Nicely done. Dan Johnson picked up his 30th home run and 95th RBI. Elliot Johnson, playing right field, added a double and two RBI to his stats. Chris Richard added to his league-leading batch of doubles with his 34th. Today’s game coverage is supposed to start at 12:50. Maybe we’ll get some background on what’s happening down in St. Petersburg. At best we’ve got to fill a big hole and, unless Carlos Hernandez or Jason Cromer (remember him?) comes off the DL, we just might not have anyone available. Here’s an update on our hitters, and a new stat, bRAA (wRAA). Without digging into it too much, let’s just say that this number is how many runs a batter contributes to a team, above the league average. The problem, for evaluating Bulls, is that I’m guessing that the site where I get these numbers (www.statcorner.com) is using American League averages, not International League averages. 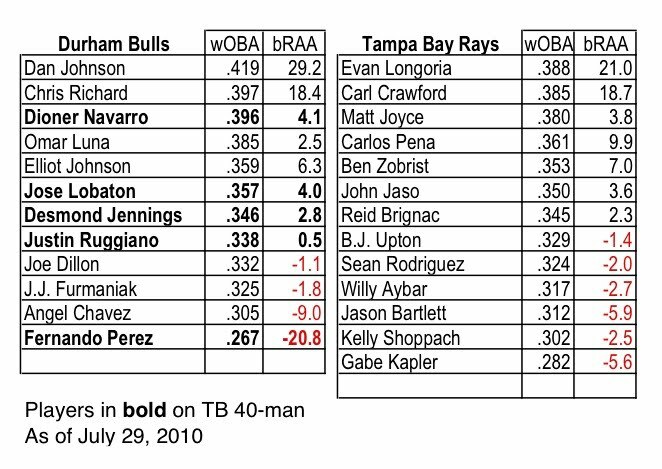 That’s OK with me, because all I really want to show is the relative ranking of our hitters (and, obviously, Rays hitters as well). We would assume that going from the International League to the American League would result in a drop. How much? Hard, possibly impossible, to tell. Nevertheless, this is a number we can assume that Rays’ management is looking at. What does the table tell us? Dan Johnson is having a terrific year. We knew that. Chris Richard’s year is much better than certainly I thought, as is Elliot Johnson’s. Desmond Jennings and Justin Ruggiano, only so-so. Fernando Perez, awful. If these were the only numbers, you can see some obvious potential swaps between the teams. Does anyone believe that now? Should we pay much attention in the future? In the short run, the Rays acquisition of a reliever, Chad Qualls, doesn’t necessarily affect the Bulls since they put Grant Balfour on the DL after a particularly dumb move on his part, otherwise someone would have to have been pushed overboard. But then there’s Rays first baseman Carlos Pena being pulled from last night’s game. Is that going to force the Rays to finally take a look at Dan Johnson? Looking at that table above, they could do worse. So, why is Perez on the 40-man roster? These guys get paid more, right? Shouldn't that privelage go to a more capable Bull? Perez was called up in late 2008, so that was when he went on the TB 40-man (and started drawing at least the major league minimum of $400,000). Once on the 40-man a player has to go through waivers to be taken off. That means another team can "claim" him if they are willing to take on his salary (and they have to put him on their 40-man — I think). Perez was injured in spring training in 2009 and spent almost all year on the disabled list. He played a few games for the Bulls at the end of the year. So he started the year still on the 40-man and, I'd guess, the Rays so no reason to try to take him off. At this moment the Rays have vacant 40-man slots and are stuck with his salary anyhow, so no reason to try to pass Perez through waivers. If they ever do decide to fill up their 40-man then I'd bet that Perez will be the first to go if they need a slot. Hope that makes sense. If not, let me know and I'll try again. 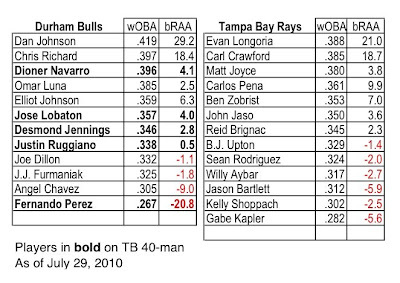 Yeah, there is not really a reason for the Rays to make changes to the 40-man until they have to. It is a process to get guys off and it doesn't make any practical difference right now. "Because we only tweet the facts as we know them. Things in baseball change on a daily basis." I'd like to think that Bulls staff aren't in the pockets of the Rays front office. The lesson, if he chooses to take it, is to not report it to the public. At best he looks a fool; at worst simply untruthful and not to be trusted.